CARLSBAD, Calif., April 18, 2018 /PRNewswire/ -- Odyssey, the #1 Putter in Golf, today announced its new EXO line of putters. EXO creates maximum forgiveness from advanced multi-material construction, and its new White Hot Microhinge Insert which combines legendary White Hot feel and sound with immediate roll from our Microhinge Insert Technology. EXO features three of Odyssey's most popular mallet head shapes: Seven, Rossie, and Indianapolis, and each of these models is offered in face balanced and toe hang options to fit a golfer's stroke. 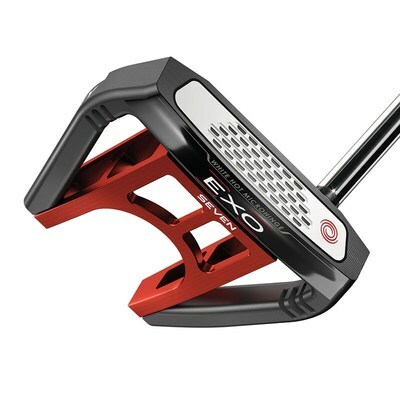 Odyssey EXO putters will be available nationwide on May 18, 2018. Maximum Forgiveness: With lightweight 6061 milled aluminum in the center, Odyssey engineers can take weight away from the center of the head and redistribute it to the perimeter of the head, which is made of 17-4 stainless steel. This concentrates weight, driving up the Moment of Inertia, or MOI (which is related to forgiveness), significantly for more consistent ball speeds and directional control. White Hot Microhinge Insert: Combines legendary White Hot Feel with our proven Microhinge Insert Technology that creates immediate forward roll for more consistent distance and directional control. Mallets (and Mallets With Toe Hang): The Odyssey EXO line of putters provides face balanced options with double bend shafts (which reduce face rotation in the stroke) and toe hang options with our S necks (which allow for more face rotation in the stroke) on each model. Whatever a golfer's stroke path, Odyssey has ultra high MOI mallets to fit his game. #1 Putter in Golf based on Golf Datatech On/Off Course Combined Unit Sales, March 2017-February 2018.